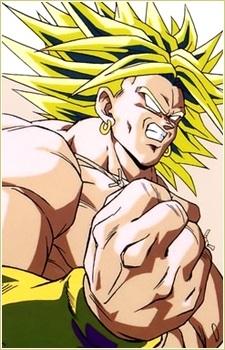 Broly was the Legendary Super Saiyan born in more than a thousand years. At birth, he had an unusually high level of strength for a Saiyan. Broly's exceptional gifts marked him as being the Legendary Super Saiyan. King Vegeta feared this and ordered for his execution. His father, Paragus, begged to spare his life. King Vegeta ended the argument by blasting him. As Broly's execution was carried out both he and his father were left to die. While Paragus barely survived the blast, Broly survived the attempted execution only to grow stronger. On that same day, Frieza acted on his own fear of the Super Saiyan legend and attacks Planet Vegeta. Amid the destruction, Broly encased himself and his father in a powerful shield of energy and escaped. As great as Broly's power was, his emotional instability was greater. Fearing Broly's state of mind, Paragus had a scientist create a special control device to keep Broly controlled. Successful in controlling him, Paragus planned to have revenge on King Vegeta's son. When Broly encountered Son Goku, Broly became erratic though he was brought back under control by Paragus. Eventually, Broly overpowered the control device, and fully manifested his powers. No longer under the device's control, he unleashed his fury on Goku, Vegeta, Son Gohan, Future Trunks, and Piccolo, and defeated them all. The Z warriors eventually channeled their energy into Goku, who used the energy for one last powerful blow that seemingly killed Broly. Edward Elric. Zero Kiryuu. Broly. Vic Mignogna has an impressive voice acting resume, and it's only getting longer. I sat down with him at Anime Weekend Atlanta to talk theater, anime, fandom, and faith. Was there alchemy? Read on! From the legendary kamehameha to the mystical dragon Shenron, Dragon Ball Z is packed with iconic imagery.The Super Saiyan, however, makes its mark as not only one of the most iconic images in Dragon Ball Z, but in all of anime.